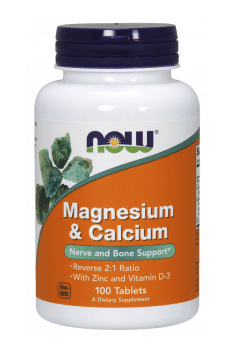 Magnesium & Calcium 100 tab. Because of the multitude of active ingredients, the supplement will not be effective in correcting deficiencies of single minerals. In this case, monopreparations are a much better choice. The daily dosage can be increased for individuals with increased demand for nutrients. During supplementation with large doses of vitamin D3, which is one of the ingredients of this formula, we should remember to test regularly levels of the metabolite 25(OH)D.